I cannot seem to find my app settings in the setting app after updating my iphone to iOS 10.3 beta 4 (14E5260b). The issue is still present even after waiting a night, so it's not an issue about apps taking a long time to load. Were they moved or removed? If they were moved, can you tell me where I could now find them? I experienced this issue for the first time this morning, on iOS 10.3. To fix, I simply opened multitasking view (double-click Home), and ejected the Settings app. Upon reopening it, app settings returned beneath TV Provider. I’m quite surprised at the number of bugs with the Settings app since iOS 10 (another would be the disappearing navigation arrow in the upper-left). This appears to be a bug in iOS and quite an old one at that. It may be caused by an app providing bad settings metadata, but I haven't yet found the true cause. I've seen two solutions work. 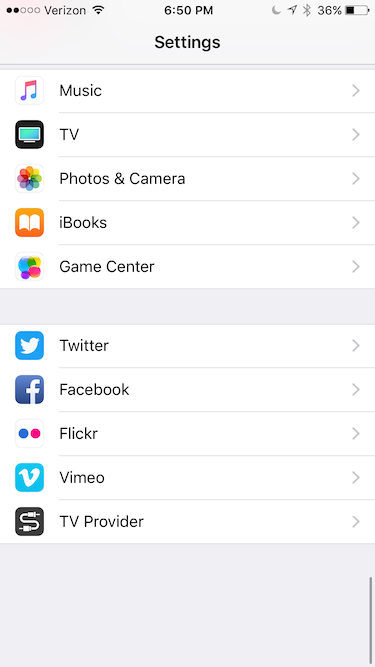 Your best bet is to try just killing and reopening the Settings app. I've seen this work on at least a few occasions so it should be your first attempt. However, if that fails you, another solution that I've seen work is to go into Settings->General->Reset and choose Reset All Settings. However, be warned, you'll lose literally all your settings, including passcodes, fingerprints, wi-fi connections, device name, etc. etc. Kill all te apps. Click the home button twice and swipe all the apps stored on your screen until they are all gone. Only your home screen should be showing. Some of my apps but not all of them were showing in settings. In Settings ->Notifications, I was missing my Class Dojo app entirely. I was not receiving instant messages from my son's teacher but couldn't change the settings. Some online answers recommended uninstalling/reinstalling the entire SETTINGS app, but I didn't want to reset ALL my passwords etc. (I just did that a few weeks ago when I had to get a new phone after speaker wasn't working. In fact, that's when I started having problems). I just un/reinstalled the one affected app and that seemed to work. I may find others affected later, but so far it seems to have just been that one. My solution was to uninstall/reinstall one app. It was then that all installed apps reappeared in Settings. Not the answer you're looking for? Browse other questions tagged iphone settings ios beta-seed-program . How to get apps to finish updating on iOS? Where in iOS 8 do I customize the notification centre?